The insights will include but not limited to the following! Before that, the website will be scraped using python's BeautifulSoup package. To understand the page structure, Chrome browser developer tools will need to be used. This is done to identify the Classes that will be searched to get the required information. A sample URL that we're going to loop and scrape is the following https://www.datacamp.com/community/tutorials?page=2. As we can see, the page=2 argument changes for each page. In order to loop through all the pages to get the necessary dataset, we need to find out the number of pages. The following lines of code do just that. Now that we know how many pages we need to scrape and have declared our variables, we will now use a for loop and go through each page one by one to get our fields of interest as shown below. Note that we will end up having list of lists for each column of interest, but later we will be flattening the list further so that it can be used for Data Frames. The last statement in the cell above converts the date values (which are currently in String Format) to DateTime. The lists will now be grouped into a dictionary, and a data frame will be created for further analysis. The last command saves the data frame to a CSV file so that it can be used later on. 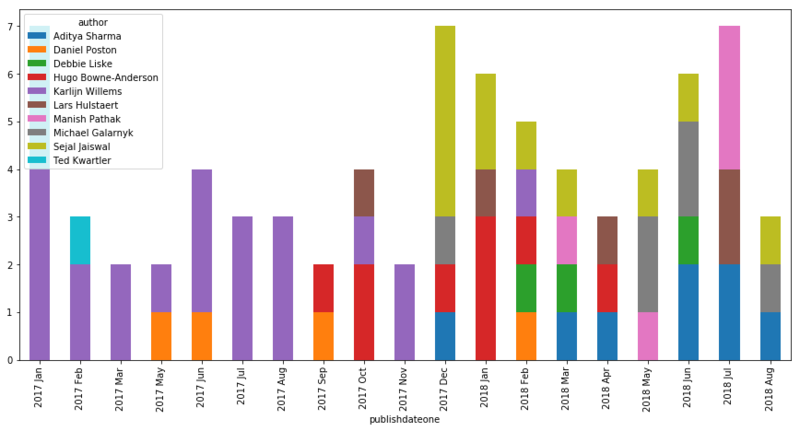 Now we are attempting to read into the collected dataset from the CSV file we just created. The above command tells us we're dealing with a dataset of 176 rows and 5 columns. 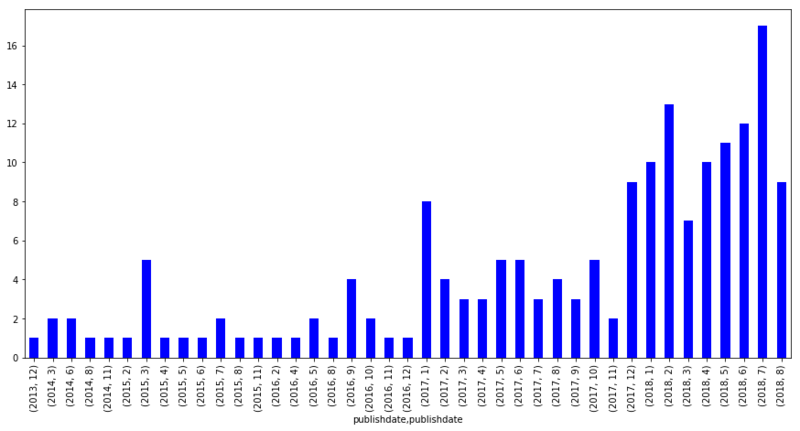 Showing the first 5 rows of the dataset above using the head function. The first line in the above code section creates a new column with the publish date formatted as a Year-Month format. The second line assigns value 1 to a new column posts being used later. Tutorials have paced up in 2018 with especially starting March onwards with a consistent upwards pace. Since this data was pulled in mid-August and almost crossing the middle line of July's tutorials count, we might be having August as the month with highest posts so far this year! While we're pacing up on all these tutorials, who have been contributing on them along the way? Here we go with a simple bar chart highlighting this very fact. This is what happened in the code section above. Now what we're going to focus on is since when and at what pace have these top 10 contributors been posting tutorials. For this, we will be using the list we just created along with some transformations to come up with a stacked bar chart that we need. 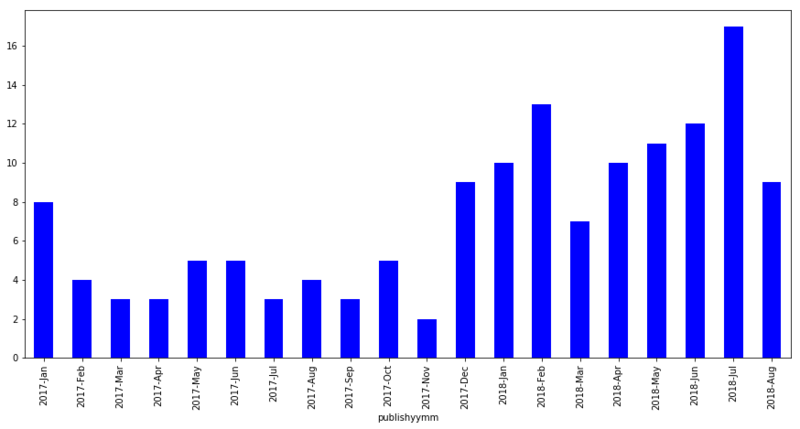 Now that we're going to visualize using a stacked bar chart, the data set will now be pivoted by having the date field as the Index, Posts as values which are to be aggregated, and Authors as columns. 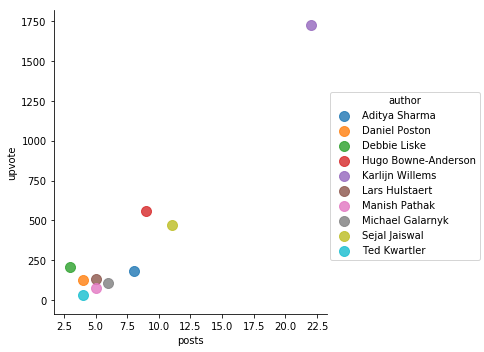 Here is what we possibly get out of the above Chart along with considering the earlier visualization of Tutorial Counts by Authors. 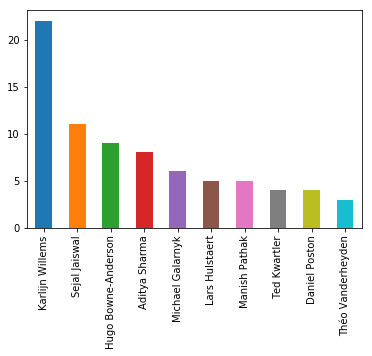 While Karlijn Willems has been at the top for Tutorials count. She's also the first to start it all off! Sejal Jaiswal while being the third by count, starts at a high pace and is being consistent with an average of 1 post a month. Aditya Sharma might be crossing Sejal if the same pace is maintained in the coming time. When a reader likes a tutorial, an upvote is signaled respectively. Let's see who's managed to get a good amount of upvotes vs. number of tutorials they have posted! We'll be considering the top 10 contributors in this case as well. This will be done by using a scatter plot. While Karlijn Willems has almost double the number of published posts, the number of upvotes are incredibly high! Around 3 times as much compared to Hugo's upvote count. Sejal has managed to be third while others have got some ground to cover to match the pace. I hope this gives a head start to many of us in exploring this and more data sets in a similar fashion! If you would like to learn more about Python, take DataCamp's Introduction to Data Visualization with Python course and Importing Data in Python (Part 2) course to learn about BeautifulSoup.